Our most recent report (November 2017), which judged Sedgefield Hardwick to be ‘Outstanding’ can be accessed here. The Department of Education (Dfe) Performance Tables provide a reliable and accessible source of comparative information on pupil attainment and progress, absence, workforce and finance. The Performance Tables include percentages of pupils attaining in line with age related expectations and those performing at a greater depth in reading, writing and maths and the percentage of expected progress in each subject. You can find the School Performance Tables from the DfE by clicking the link below. In February 2017, we received a letter from Nick Gibb, Minister of State for School Standards, to congratulate us on our 2016 KS2 mathematics results. As a result of 100% of our Year 6 pupils reaching or exceeding the expected standard, our school is in the top 2% of primary schools in England for attainment in mathematics. This level of performance would not be possible without the hard work and dedication of all stakeholders – pupils, parents, governors and staff. 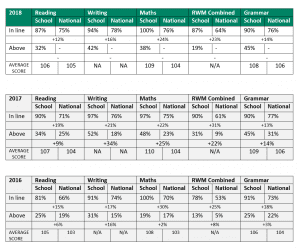 The table below shows the proportion and percentage of pupils who achieved the end of Key Stage 2 expectations in relation to swimming. Pupils are expected to be able swim competently, confidently and proficiently over a distance of at least 25 metres, use a range of strokes effectively [for example, front crawl, backstroke and breaststroke] and perform a safe self-rescue in different water-based situations.